This superior category oil is cold-pressed from black olives harvested when perfectly ripe. This special Subtle selection reveals fine and light notes. You will discover the flavours of olives with a light fruitiness and no hint of bitterness. This oil is ideal for everyday use, as a dressing or in cooking, whichever takes your fancy. Rich in unexpected flavour, it reveals new aromas with every taste. It is particularly recommended for Mediterranean-style seasoning. Ideal on olive bread, a vegetable bake or white meat. It takes an average of 5kg of olives to make 1 litre of oil. The olives are stored as briefly as possible (at most 2-3 days). The sorted olives are cleaned with water. Stone grinding: the whole olives are ground to tear the cells of the fruit (pulp, stone and kernel) and thus release the oil. Kneading is essential to facilitate oil release and improve yield. The oil is separated from the vegetation water by centrifugation. This pure, untreated fruit juice, produced at low temperature (30-40°C) is wholly natural. The designation “extra virgin olive oil” is given to oil with acidity below 0.8% (EU legislation). 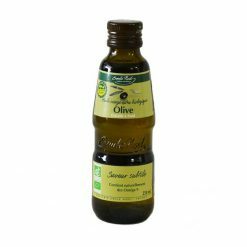 Particularly recommended for all Mediterranean-type dressings but also everyday cooked dishes. Rich in unsaturated fatty acids, including 75% Omega 9. Contains phenols (natural anti-oxidants, ~ 20mg/100g. Emile Noël is the leading supplier of high-quality organic oils in France and a pioneer in organic oil milling. The company shifted to 100% organic sourcing in 1972, and has subsequently helped set the agenda for those standards. It is an independent family business established in 1920. Today, it continues under the leadership of the third and fourth generations, Annick Garnier and David Garnier. Emile Noël has set the highest standards in quality and taste by ensuring that analyses are carried out on raw materials, during processing and on each finished product. If the company’s standards are not met, the oil will not be bottled. Where possible, the company sources raw materials from as close to its French base as possible. If the required ingredients are not available, the company establishes relationships to source ingredients based on fair trade and the long-term development of its partners. Emile Noël makes over 20 organic virgin vegetable oils, offering a taste suitable for everyone’s palate and aiding the creation of a varied, balance diet. All oils are extracted without using additives, chemical treatments or high temperatures.